Flipover Disease or sometimes known as Swim Bladder Disorder is very common illness seen affecting Goldfish. Flipover disease will cause the fish to list or swim on one side and it will struggle to maintain balance and buoyancy in the water. At the advanced and critical stage of the disease, goldfish will float upside down and most of the time it will stay that way. When this happens, usually there is little chance for recovery and the only cure in sight, is by using surgical procedures conducted by veterinarians. Therefore, it is very important to treat early symptoms as soon as possible once it is detected so that it won’t come to that advanced stage. Goldfish flipover disease is often associated with poor water quality with high nitrite and nitrate levels. Research conducted has reasons to believe that high concentration of these harmful chemicals will cause dilation of capillaries affecting the air sac and then leading to inflammation and swelling. Since the air sacs functions to control buoyancy and help to fish swim, failure of the organ will cause the fish to flipover. Other hypothesis seems to suggest that parasitic infection and intestinal problems could also be among the probable causes but this has yet to be supported by clear evidence. 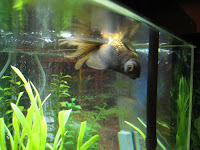 Another probably cause of flipovers or swim bladder disorders is temperature shock resulting from large water change. It is very important that the temperature of the fresh water should be confirmed close (around 2-3degC difference) or the same with temperature of the old water before adding in. This will prevent shock effecting the air sacs and prevent it to function normally. Usually early signs of flipover disease can be treated by changing the diet plan to feed only peas. Frozen small fresh peas should be tossed into the water for the goldfish to eat wholly. Immediately conduct at least 50% water change and test for the nitrate and nitrate levels. An ideal level for nitrites should be close to zero or less than 0.5ppm while nitrates should be kept below 50ppm. Use aquarium water test kits to help you on the testing and if found that the chemicals are still at dangerous levels, increase frequency of water change. Remember to ensure that the temperature of the fresh water is almost the same as the old one in order to prevent escalating the condition.